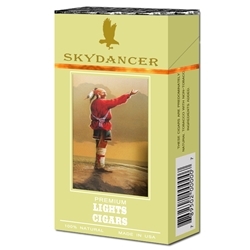 Skydancer Light Filtered Cigars are available in Box 100's and packaged 20 cigars per pack, 10 packs to a carton for a total of 200 premium filtered cigars. Skydancer Filtered Cigars are perfect for those who like their cigars to have a complex blend of flavors. If you are a novice and are still testing the waters, the Light version may just be right for you thanks to the mellow smoke, which will not overwhelm your senses. The pride that the Native American tribes take in their heritage is reflected in the impeccable and delightful Skydancer Cigars. Priced economically, these cigars are a mark of purity and quality. This item is unavailable at this particular time. Call our Customer Service for an alternate brand you can try. Thank you and sorry for any inconvenience.